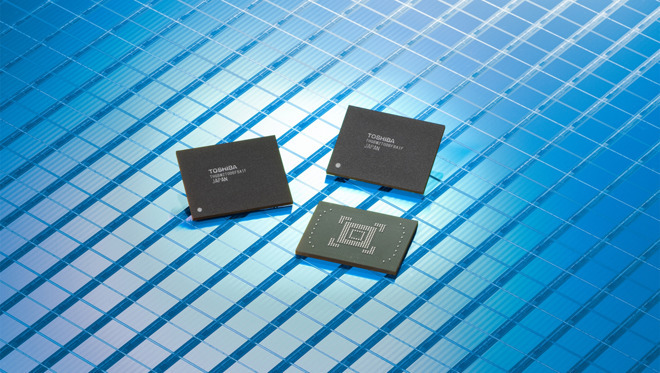 Three tech firms —Apple, Amazon, and Google —have reportedly joined the considerable list of bidders of Toshiba's NAND flash memory business, now on the market as Toshiba looks to raise $9 billion to cover losses at its U.S. nuclear unit, Westinghouse. The new entrants' bidding prices are unknown, according to Japanese publication Yomiuri Shimbun, quoted by Reuters. On Friday however, two joint bidders —chipmaker Broadcom, and private equity firm Silver Lake Partners —were reported to have bid about $18 billion. Other bidders are believed to include various financial investors as well as memory makers Micron, SK Hynix, and Western Digital, the latter of which already operates a chip plant with Toshiba in Japan. Both Micron and SK Hynix count Apple as a client. Two other Apple partners, Foxconn and TSMC, have previously been rumored as bidders but could be out of the running because of Japanese national security concerns. Toshiba is in fact thought to be leaning towards U.S. companies, not only because of security but because going in that direction could ease dealings with the U.S. government over Westinghouse. If Apple were to win a bid it would give the company a lock on memory supply for Macs, iPhones, iPads, and other devices, likely removing any production bottlenecks. At the same time however it would have to deal with Toshiba's legacy clients, and either phase them out or enter the global memory business. The latter situation is unlikely, since memory supply isn't an area of Apple expertise and the company would have to sell chips to rival electronics makers. Apple normally keeps hardware as exclusive as possible —even some of its Beats audio gear, nominally platform-agnostic, now charges through Lightning instead of micro-USB.